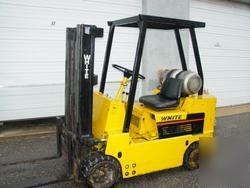 WHITE 5000 LPG FORKLIFT. AUTO TRANS, SOLID TIRES VERY GOOD CONDITION, HAND BRAKE, TANK NOT INCLUDED, NEEDS NEW SEAL ON ONE RIGHT SIDE OF FRONT PISTON OF LIFT (LEAKS ALITTLE), NO SIDESHIFT, 106" MAX HEIGHT. PICK UP ONLY. WE HAVE TWO LIFTS NOW. LIFT IS UNDER POWER AND STILL IN USE. WE ALSO HAVE PARTS MANUAL AND OPERATION MANUALS. CAN BE SEEN IN TOMS RIVER, N.J.